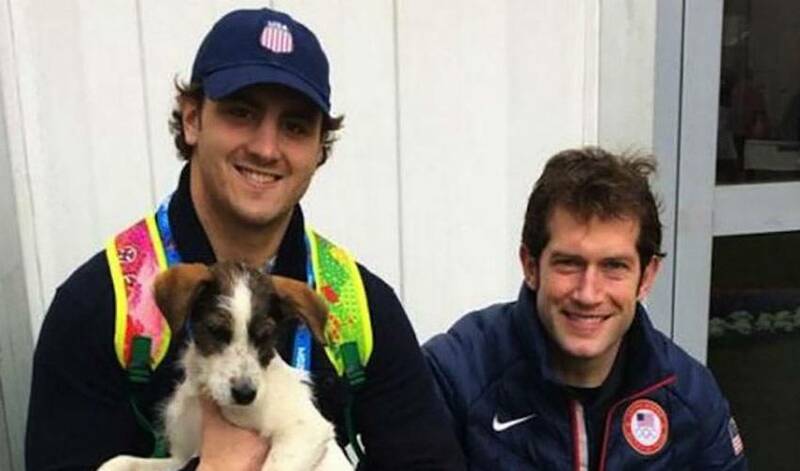 Weeks before landing in Sochi for the Men's Ice Hockey Tournament, David Backes and his wife, Kelly, heard the news that Russia had allegedly used various means to remove many of the stray dogs that ran the streets in and around Olympic Park. As they packed their bags, the Backes family was gearing up for a medal run - but they also had a rescue mission in mind. "We definitely arrived here with thoughts of adoption. We knew we wanted to do something for these animals - it was just a matter of how," explains Kelly Backes, "The goal would ultimately be transporting dogs to the USA and finding them homes through rescue organizations." And no sooner did the players and their families settle into Sochi did they stumble upon three adoption candidates - two 3-4 month old puppies (Sochi Junior & Sochi Jake) and an adult male (Sochi Jack). The dogs were discovered separately, but all around the PA House, where players and their families congregate as part of the NHLPA program over the course of the Winter Games. Adopting stray dogs and transporting them out of Sochi, however, is no easy task. Due to language barriers, it's been a difficult process to communicate with local veterinarians and shelters. The group spent three days visiting various veterinarian clinics and shelters before they managed to schedule a vet visit where the puppies received their first vaccinations. They also painstakingly filled out necessary paperwork to ensure the dogs could securely leave Russia and enter the USA. This wouldn't be the first time the Backes' moved mountains to help rescue animals in need. David has flown a plane 700 miles to rescue three dogs from a kill shelter, and the animal lovers recently launched their own foundation - 'Athletes for Animals' in November of 2013 - which works to connect rescue shelters across the USA with athlete ambassadors to help raise awareness for the welfare of homeless pets. The Backes' aren't alone in their mission. In true Olympic spirit, a number of player’s wives and girlfriends - including Megan Keffer (Jeff Carter), Nicole Arruda (Drew Doughty), and Ines Kopitar (Anze Kopitar) - have come together to help. Despite competing against one another during the tournament - win or loss - players and their families have worked as a team to clean up the dogs, take turns watching them, and purchase them food, collars, and toys. They have scheduled meetings where they contacted different shelters in Russia, and researched airlines that might be willing to fly the dogs out of Sochi. "So many people are working together on this… Something is going to get done," said an optimistic Kelly Backes. With the help of Atlas Air and the NHLPA, the group were finally given the green light to fly the puppies - Sochi Junior and Sochi Jake - home with the players and their families after the Gold Medal game on Sunday. When they land, the dogs will need to be quarantined for 30 days before they can be adopted to families. Unfortunately, Sochi Jack cannot be transported, as large animals require a heated cargo container for safe shipment overseas, which Atlas does not have. Because he and many other Sochi strays still remain homeless in Russia, the group has offered to help raise funds for LAPA (Helping Animals in Russia). LAPA is based out of the UK, and is the only animal rescue organization that provides aid to this area in the form of two shelters in Sochi. In addition to caring for the animals, the shelter runs a sterilization and adoption program to help minimize animal suffering. If you would like to donate to LAPA, please visit http://www.lapauk.org/.